...Battles were waged on newly exposed soil. New empires rose and fell as boulders smashed against fortresses and swords clashed with their foreign counterparts. Drawbridges were lowered so heroes could ride out amidst crumbling turrets and resolve, while the screams of otherworldly creatures permeated the air. The battlefields have faded, in history books and in our minds, but in Year 12, a new portal has opened, allowing us to not only see but participate in these ancient tales. Only one question remains: which side will you choose? 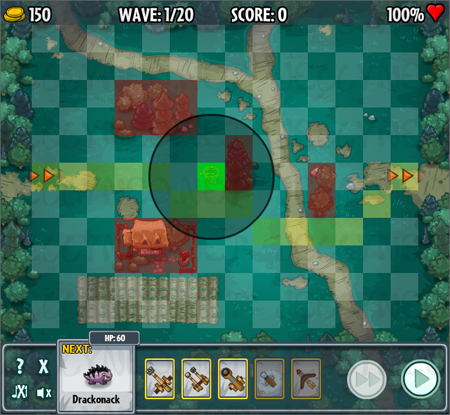 This is similar to Biscuit Brigade and other strategy computer games. First, choose a campaign, map, and the side you want to be on. Then, select the towers you want to use (it's recommended that you select the maximum of five). You'll be taken to the field and given some coins to spend. Hover over a tower to see how much it costs. Click on a tower and drag it onto the field. The black circle around your tower indicates its range. The orange animated arrows indicate the direction of your enemy's movement (it'll either be left to right or right to left). The pale yellow squares indicate the path your enemy will take to reach their destination. Enemies always have a path--if you try to block things off, the path will change, or sometimes it'll tell you that you can't place a tower there. You cannot place towers on red squares. Pick a good spot and set your tower down. 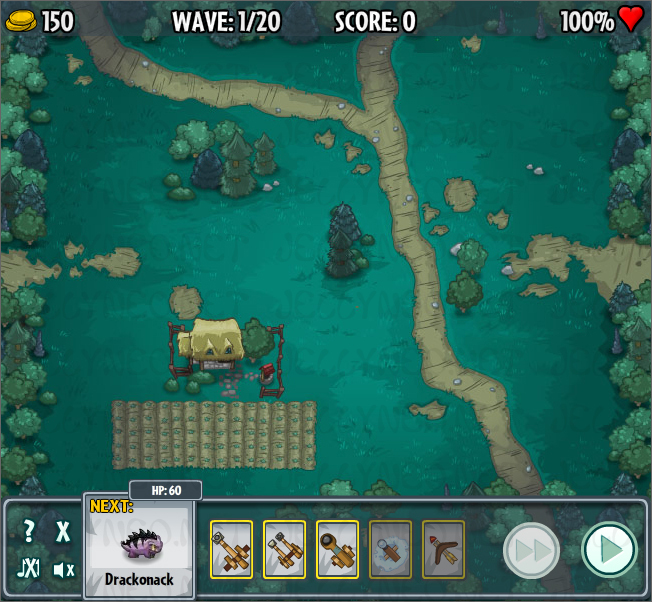 It's recommended that you spend all or almost all of your coins before you start sending in the first wave of enemies. Now that you're good to go, you can click on the blue circular button on the bottom right corner of the game screen. The button with two arrows next to it is the fast forward button. It'll make game play go a bit faster. 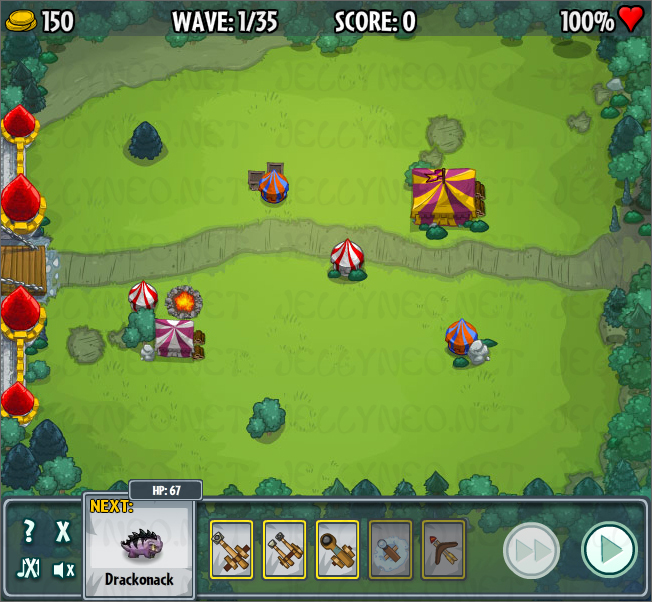 Foes will start coming in and your towers will automatically fire at them if they're within range. Every time you kill one, you'll get some more coins. If an enemy manages to reach their destination, you'll lose health, which will decrease your final score. Click on an existing tower on the field to sell/upgrade/use the special ability for it. You can pause the game at any time. There are Neocash items that you can purchase for this game. They can be found in the NC Mall and will not appear in your inventory after you buy them; rather, they'll automatically show up as options in your game. NC maps have no expiration date, but towers expire after 30 days from the purchase date (after they expire, you can buy them again if you want). The NC towers don't give you a significant advantage and you will still have to spend your in-game coins in order to put them on the field. Every map is different. 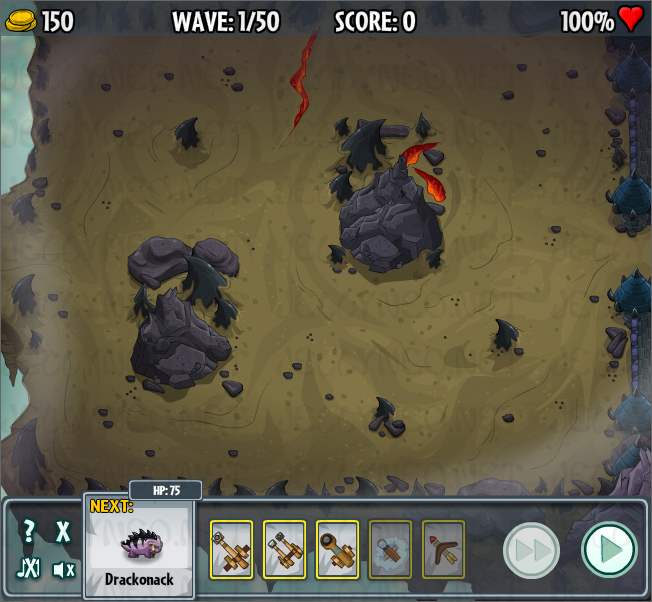 The ordering of the enemy waves is different and the total points available are different. This is not a glitch. Play on Hard maps to get higher scores. The regular hard map has the same maximum points as the NC hard map (125,266 points). I find it's easier to complete maps if you play for the Darigan Citadel. Start out by putting at least two towers on the field (I usually go for a wooden one and a rapid-fire one), near the spawn point. 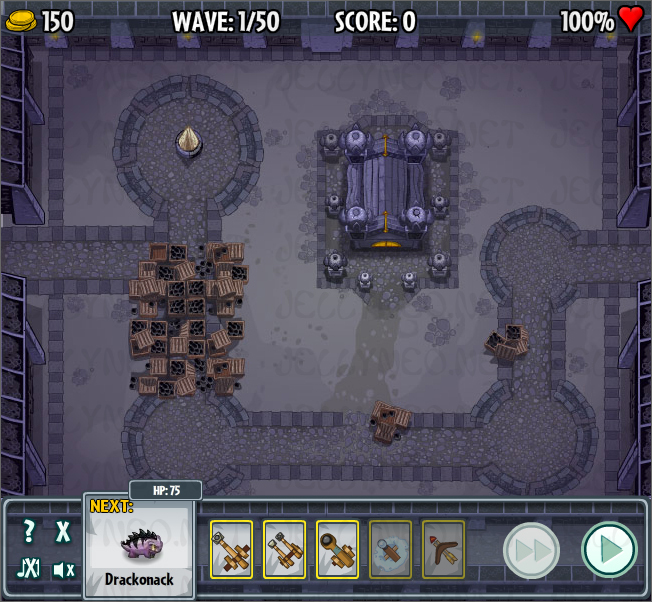 Then, as enemies are killed off and more coins are available, upgrade them at least once before putting additional towers out. Upgrades are important! They increase range, damage, fire rate, and they restore the tower to full health. So constantly monitor how many coins you have and use them to upgrade! 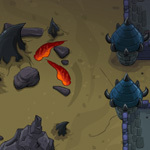 Create corridors or mazes out of towers in order to give you more time to kill enemies. Sometimes, you will see an attacker come out. These characters are the only ones who can damage your towers, and they target the ones closest to them. It's a good idea to put a cheap tower near the enemy spawn point. You can then wait until it has low health to upgrade it. 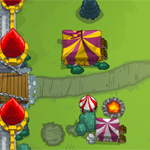 If an attacker destroys one of your towers, sell it immediately to free up the square of land for another tower. You can also sell a tower right before it is destroyed and get some coins out of it. Use the pause feature to your advantage! If you feel like you're starting to lose, pause the game and sell towers that aren't doing anything. You can also upgrade and build new towers. Use the fast forward button to speed up the game. It usually takes around 20 to 30 minutes to finish a hard map. Always, always, always try to end with 100% health so you get the most bonus points for that. In order to receive a trophy, you must be in the top 17 on the hi-score table when trophies are handed out (roughly midnight Neopian Standard Time). If you submit your score long after the monthly table reset, you might end up near the bottom of the list, but it is possible to be "bumped up" as others send their scores. 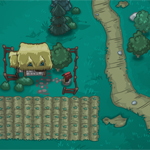 As stated before, the number and type of enemies you encounter will depend on the map you chose. Flying enemies soar above everything, so they travel in a straight, horizontal line. Attackers are the only ones who do damage to your towers and they won't stop until you kill them. You will not always have to fight a boss; again, it depends on the map (see Maps section for more information). Hover over the images to see the character's name. Where applicable, they're also linked to their Book of Ages entries. Comments: The most basic tower; an alternative to the Decoy Tower. Comments: Love this tower. It fires twice rapidly and being more efficient is always a good thing! Comments: Does the most damage out of all the non-NC towers, but the firing rate is slower. Good against heavy War Machines/Giant Tortums. Comments: Its normal attack doesn't do that much damage and its special ability (slowing down enemies) isn't really worth it if you have NC towers to choose from. Very nice range, though. Comments: Most effective against Flying enemies. The range is incredible. One or two of these is often enough. Comments: My second favourite tower. The animation for this one is hilarious (basically, a long pointy log shoots out, bends in an arc, and impales your enemy into the ground--and you get to choose where it strikes!). There's no normal attack so it won't automatically fire anything. I wait until a new wave's about to come out and then I use this tower's special attack. I position the crosshair at the spawn point and if an attacker comes, I immediately kill it with one click. Awesome! Thumper's also great against the minion-type enemies (if they're clustered close together, you can kill as many as three of them in one go). However, this tower's weak against Flying/War Machine/Giant Tortum and you have to wait for it to recharge after every use, so I usually build two of these, max out on the upgrades, and alternate between them. Comments: Its attack is a bit better than the Wooden Tower, but you're really paying for the special ability, which is that you can teleport this tower (and only this tower) to another spot on the field. You cannot teleport enemies with this. Useful if an enemy escapes your grasp and is about to reach its destination, but building other towers might be more cost effective. Click on the thumbnail images to see how maps look when you're in the game. Comments: Easy level is easy! Ironically, though, I lose more health on this than on a Hard map. Comments: Attacker comes at the beginning of wave 7, 15, 19, 27, and 32. Comments: Attacker comes at the beginning of wave 7, 14, 17, 21, 28, and 32. You'll be facing Blugthak or Castle Defender at the end. Comments: Attacker comes at the beginning of wave 7, 14, 21, 24, 28, 33, 44, and 48. You'll be facing Lord Kass or Jeran at the end. Comments: Attacker comes at the beginning of wave 6, 13, 21, 25, 30, 40, 44, and 50. You'll be facing a large number of War Machines or Giant Tortums at the end. 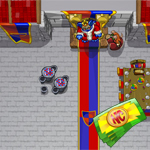 There are Neopoint and Neocash bonus items for this game. You can only win each item once. Battlefield Legends String Lights Score 10,000+ points. Battlefield Legends The Board Game Score 60,000+ points. Battlefield Legends Hat Score 100,000+ points. King Skarl Throne Background Play on the King Skarl Is Not Amused map and win the battle. Courtyard Ambush Background Play on the Courtyard Ambush map and win the battle. 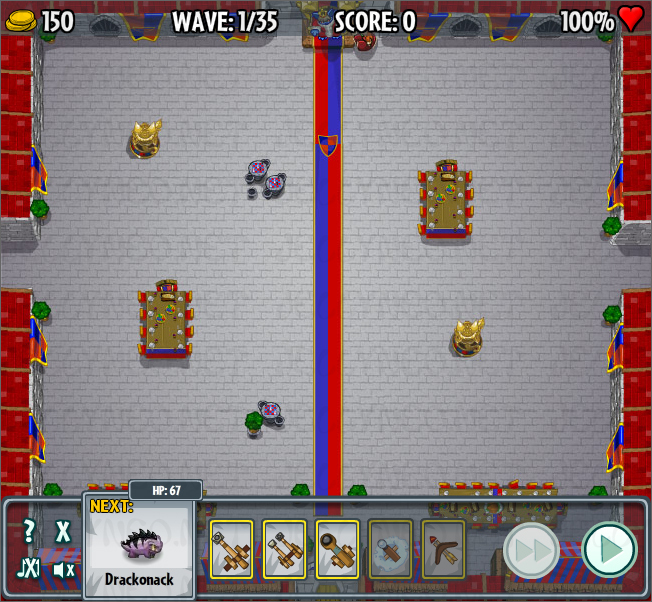 Spiked Tower Trinket Use the Spiked Tower during game play and win the battle. Thumper Tower Trinket Use the Thumper Tower during game play and win the battle. Decoy Tower Trinket Use the Decoy Tower during game play and win the battle. 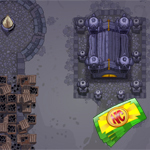 Teleport Tower Trinket Use the Teleport Tower during game play and win the battle. This page was last updated on August 31, 2018.